Ambassador-at-large Bilahari Kausikan's commentary 'Singapore is not an island', published on Tuesday, has drawn responses from across the Causeway. 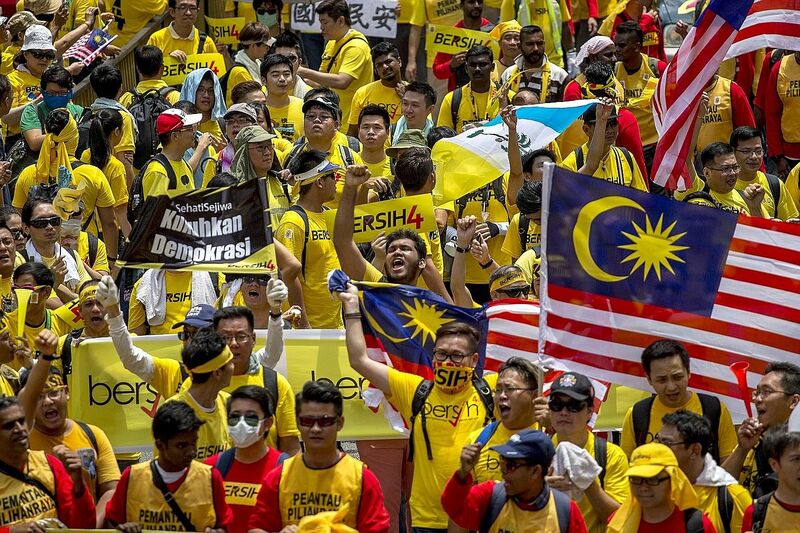 The piece discussed the systemic change Malaysia is on the cusp of and the possibility of an overwhelmingly Malay-dominant government and a Chinese opposition led by the Democratic Action Party (DAP), and the consequences for Singapore. Below are excerpts of two Malaysian opposition lawmakers' statements on the commentary and Mr Kausikan's brief response. In his op-ed titled "Singapore is not an island", Bilahari Kausikan, Singapore's Ambassador-at-large and S R Nathan fellow at the Lee Kuan Yew School of Public Policy, was quick to interpret the current political struggle in Malaysia as one that pitted the Muslims against the non-Muslims and the Malays against the non-Malays, specifically the Chinese. I was surprised by his choice to interpret the political events in Malaysia through this narrow lens, especially given his diplomatic experience, rather than to examine the political forces in Malaysia as part of a larger global trend, where regimes that were once seen as impregnable were brought down through a peaceful electoral route. And it is this route which the opposition forces in Malaysia are committed to. Malaysia's Barisan Nasional coalition is currently the longest- ruling government via popular elections in contemporary political history. But it is not the longest. The Institutional Revolutionary Party, or PRI, ruled Mexico unchallenged from 1929 to 2000 with regular elections. But in the 2000 presidential elections, the PRI candidate, Francisco Labastida Ochoa, lost to PAN's Vicente Fox Quesada, a former Coca-Cola executive and governor of Guanajuato, in a three-horse race. In 2000, the uninterrupted rule of the Kuomintang party in Taiwan was also ended with the victory of the Democratic Progressive Party's Chen Shui-bian, also in a three-horse race. More recently, Japan's Liberal Democratic Party, which had dominated post-war politics in Japan for more than half a century, lost the 2009 general election to the Democratic Party of Japan. What did these regimes have in common? Many years of political dominance had led to ever- increasing amounts of unchecked corruption. Inter-elite splits within the ruling coalition had slowly weakened them over time. And the opposition had consolidated and/or strengthened over time in order to pool their forces to defeat the long-ruling regime. This is the context in which Malaysia is finding itself today. Given Malaysia's electoral system, that is, a parliamentary rather than a presidential system, the opposition cannot count on winning power via elite splits in a presidential race. Furthermore, in a grossly malapportioned electoral system, the only way in which the opposition can win a majority of seats is by winning at least some of the semi-urban and rural seats on top of the urban seats it overwhelmingly won in the 2013 general election. And given that these semi-urban and rural seats are predominantly Malay or Bumiputera (in Sabah and Sarawak), this would mean that the opposition would have to win a larger percentage of the Malay and Bumiputera vote. No one in the opposition is deluded in thinking that we can win a majority of seats just by winning an overwhelming majority of non-Malay, and especially Chinese, votes. Nor are we deluding our supporters into thinking this. Indeed, Ambassador Kausikan should be reminded that 40 Bumiputera (39 Malays and one Kadazan) opposition Members of Parliament were voted into office in the 2013 general election, compared with just 32 Malay MPs in the 1999 general election, which saw PAS emerging as the largest opposition party. What we want to do, in fact, what we have to do, is to build a broad-based coalition which can win at last 60 per cent of the popular vote (which would mean winning a significant percentage of the Malay and Bumiputera vote). We can do this not just by highlighting the excesses in terms of corruption and abuse of power by the ruling coalition, the rise in the cost of living due to the ham-fisted implementation of the goods and services tax and the pathetic attempt by the ruling coalition to raise inter-ethnic tensions, but also by presenting a set of clear policy alternatives on how a new opposition coalition can govern better, compared with the ruling regime. Ambassador Kausikan is right to say that Singapore has "no choice but to work with whatever system or leader emerges in Malaysia". But one cannot help but wonder if his fears about a possible transition in power in Malaysia, especially one that is peaceful and well-ordered, is driven more by his fears of such a possibility in Singapore in the distant but foreseeable future than by his concern of what might happen in Malaysia. "It is my impression that many young Malaysian Chinese have forgotten the lessons of May 13, 1969. They naively believe that the system built around the principle of Malay dominance can be changed. That may be why they abandoned Malaysian Chinese Association for the DAP. They are delusional. Malay dominance will be defended by any means." In fact, he even warned that the likely outcome of the above will be "even less space for non-Muslims". The top Singapore diplomat could not have got it more wrong. Firstly, Bilahari needs to distinguish the principle of Malay "dominance", which is significantly different from Malay "supremacy" contested by most opposition voices. No one denies that Malays will dominate the sphere of politics and economy in Malaysia. They will generally dominate purely because they comprise the majority in the country. Perhaps Bilahari can understand the distinction better in the context of Singapore, where the Chinese indisputably dominate the political, economic and social space. However, that does not translate into a Chinese-supremacist city state. And perhaps Bilahari has overlooked that fact that even the DAP, whose leaders are undeniably comprised of a Chinese majority, fully support Anwar Ibrahim as the prime minister candidate for Malaysia. As far as we can tell, Anwar is and has always been a Malay and a Muslim. Secondly and more crucially, Bilahari failed to recognise that the anti-establishment sentiment and the recent Bersih4 rally aren't at all about race. No one went to the mega-rally holding placards or shouting slogans making racial demands. Those who attended the rally certainly did not see themselves present to represent their ethnic roots. They took part in the rally because they aspire for a better country defined not by race or religion, but by the principles of justice, good governance and democratic ideals. They were angry, frustrated and galvanised to act in the light of the tens of billions of ringgit embezzled and misappropriated by 1MDB, as well as the obscene RM2.6 billion (S$870 million) donation deposited into the prime minister's personal bank account. "The 1MDB scandal is less about corruption than about a struggle for power within Umno. Dr Mahathir seems to have expected to exercise remote control even though he was no longer prime minister. Among his grievances with his successors were their warming of ties with Singapore, Najib's decision to settle the railway land issue, cooperation on Iskandar Malaysia (IM) and the refusal of both Abdullah Badawi and Najib to proceed with his pet white elephant - the 'crooked bridge'. Dr Mahathir wants to replace Najib with someone more pliable. "Najib understands that Malaysia and Singapore need each other. So far and unusually, we have not figured very much in the controversies." It is clear from the above that Bilahari wanted to persuade Singaporeans that despite the disgraceful multi-billion-ringgit corruption scandal Najib is entangled in and his less-than-legitimate election to office with funds sourced from dubious unknown sources, it is better the devil you can cut deals with. While Singaporeans "have no choice but to work with whatever system or leader emerges in Malaysia", he emphasised that "some systems will be easier to work with than others". Clearly, as the ambassador-at- large, Bilahari's views demonstrate how Singapore as a country, despite its enormous wealth and developed nation status, completely lacks a moral compass. It is less important for him to support "what is right and just" as opposed to "what is in it for me" in Singapore's relations with its neighbours, regardless of how evil or corrupt a regime is. I can understand their hopes, but hopes are not reality. The emotions on display prove my point and serve as a useful reminder to Singaporeans that the social cohesion that we currently enjoy is not to be taken for granted. I wish allthe peoples of Malaysia well, but my concern is Singapore.